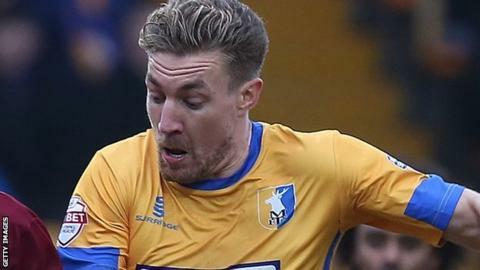 Wrexham came from behind against lowly Altrincham to claim their third successive National League draw. Josh Ginnelly, on loan from Burnley, converted Ryan Crowther's cross to give Altrincham the lead. But Simon Heslop's glancing header from Kayden Jackson's cross brought Wrexham level before the interval. Robbie Evans, Blaine Hudson and Connor Jennings all had good opportunities to secure victory for the visitors in the second half. Gary Mills' Wrexham are 12th in the table, four points behind the play-off spots, while Altrincham remain in 19th. Wrexham manager Gary Mills told BBC Radio Wales Sport: "You don't get many games where you get chances like we have had in the second half and haven't taken them. "It's come back to bite us again and another two points have gone missing. "We know we need to win games now. We're four points off that fifth spot and it's still up for grabs." Match ends, Altrincham 1, Wrexham 1. Substitution, Altrincham. Dylan Mottley-Henry replaces Ryan Crowther. Jonathon Margetts (Altrincham) wins a free kick. Attempt saved. Ryan Crowther (Altrincham) right footed shot from outside the box is saved. Foul by Scott Leather (Altrincham). Attempt saved. Jonathon Margetts (Altrincham) right footed shot from the left side of the box is saved. Attempt saved. Rob Evans (Wrexham) right footed shot from outside the box is saved. Attempt saved. Mark Carrington (Wrexham) right footed shot from outside the box is saved. Substitution, Wrexham. Mark Beck replaces Adriano Moke. Attempt missed. Josh Ginnelly (Altrincham) right footed shot from the centre of the box misses to the right. Attempt missed. Josh Ginnelly (Altrincham) right footed shot from more than 35 yards misses to the right from a direct free kick. Foul by Simon Heslop (Wrexham). Attempt missed. Jake Moult (Altrincham) right footed shot from outside the box misses to the right. Second Half begins Altrincham 1, Wrexham 1. First Half ends, Altrincham 1, Wrexham 1. Attempt missed. Kayden Jackson (Wrexham) right footed shot from outside the box is too high. Simon Richman (Altrincham) is shown the yellow card for a bad foul. Goal! Altrincham 1, Wrexham 1. Simon Heslop (Wrexham) header from the centre of the box to the top right corner. Assisted by Kayden Jackson with a cross.